The Trail Lite Duo Cook Set delivers all the lightweight, space-saving benefits of a minimalist cook set, without forcing you to be Spartan about what you cook. 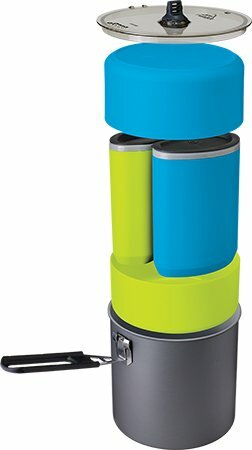 The system features a tall 2 liter hard-anodized aluminum pot that accommodates two and keeps the menu options open. 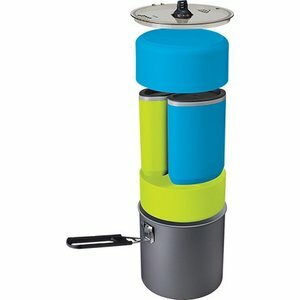 The dish set includes two color-coded MSR DeepDish™ Bowls and Insulated Mugs, which nest perfectly inside the pot for all-in-one packing convenience and space-maximizing efficiency. The folding, locking handle keeps it all in place inside your pack as you cover the miles. Compact: Nesting design fits two DeepDish™ Bowls and Double-Wall Insulated Mugs inside pot. Includes: 2.0 L Hard-Anodized Aluminum Pot w/ Nonstick Coating, Clear Strainer Lid, (2) Double-Wall Insulated Mugs, (2) DeepDish™ Bowls.